The Vine had of course only been rented by Arthur Studor and then Arthur Ulric Zimmerman from the Foley Estate and, on Arthur Ulric’s death in 1963, the house fell back into the use of the Foley family. Mrs Helen Foley, the widow of Henry (“Tom”) Foley, lived in the house from 1964 to the mid-80s, initially with her son Andrew and daughter Anne. Her second son, John (now Lt. Gen. Sir John Foley KCB OBE MC), was in the Army and therefore only lived in the house intermittently. The house required a large amount of internal renovation, as little seemed to have been done in the Zimmerman years other than essential fabric maintenance. Thus the house was now re-wired, more modern heating provided, a new kitchen fitted and internal partitions in the present Drawing Room and Hall taken down. Finally various features and fittings (particularly three fine 18th century fireplaces) which had been salvaged from the Stoke Edith mansion of the Foleys, destroyed by fire in 1927, were installed. Helen Foley is remembered still by some of the older residents of Tarrington as a tall and rather “grand lady” of the old school – one who was liked and respected but also held in some awe! She was the President of the Tarrington WI and its 24- year celebratory party was held in the house. She was a keen gardener and many of the present flower beds owe their design and inception to her. There were no live-in servants for most of the time of Helen Foley’s residence but a number of ladies came in regularly to cook, wash and clean. Elsie Hill, the village post-mistress, worked part-time in the house and gardens practically for the whole period of Helen Foley’s stay there. Elsie was assisted in the gardens by Bill Weaver, the local postman, and a Mr Renshaw who lived next to the Deems on the way to the Common. June Andrews moved into the village with her husband Tom in 1965 and lived initially at 16 School Road (now Heritage Cottage), at that time rented from the Foley Estate. After a few years June started working in The Vine – initially cooking for the fairly large dinner and house parties that Helen Foley held there from time to time. After a while she came more frequently to help with the housework. She remembers treating and staining the big beams on the Hall ceiling. 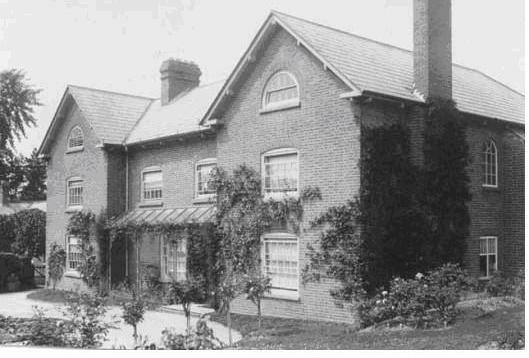 Several ladies living in Vine Cottage (also at that time rented from the Foley Estate), worked also in The Vine during these years. The Richmond family lived there from September 1973 to September 1977 and Marie-Louise Richmond cleaned and cooked for Helen Foley during that time. Marie-Louise’s son, Andrew, remembers that every now and then he would be treated by Helen Foley to a trip to Hereford in her Austin Cambridge. In Helen Foley’s absence, Andrew and his brother would play around the barn and outbuildings, and be able to walk home from the village school across the orchard by the playing field. Bill Weaver encouraged the young Andrew to take an interest in the garden, (an interest which Andrew has retained to the present). Andrew remembers Elsie Hill working in the house, but his impression was that the house was run very much with a skeleton staff and, whilst the grass and hedges in the garden were regularly cut, the house needed rather more work to keep it ship-shape. Vine Cottage itself also left something to be desired. The Richmond family used to get electric shocks through the tiles on the scullery floor and then discovered that the cottage had no proper earthing! Vine Cottage had a small garden then, behind what is now Vine Barn. The family maintained good relations with Helen Foley whom Andrew describes as being tough on the outside but with a soft centre. During these years, Molly Green also cooked in the house, then a Mrs. Richards and finally Jill Evans. Jill Evans moved into Vine Cottage in about 1979. Her father, Maj. Geoffrey Godby, had been Farm Manager for the Foley Estate since the 1960s and the family had lived at the Glebe Farm in Stoke Edith. Soon after moving into Vine Cottage Jill started working 3 times a week at The Vine, helping out round both the house and gardens. She continued this work for as long as Helen Foley lived in the house, and was practically full-time towards the end. Jill remembers that, as Helen Foley became more frail with advancing years in the early 1980s, a succession of 3 or 4 young Australian girls were employed to live in the house to keep an eye on Helen Foley’s well-being round-the-clock, as well as to help out round the house. Jill particularly remembers Stephanie and then Vicky. It was Stephanie who for some time pulled the wool over Helen Foley’s eyes as to who was sleeping in her garage! In the 70s and 80s there was an odd-job man in the village called Charlie Holbrooke. One of Charlie’s jobs was cider-making at Tarrington Court and perhaps it came to Stephanie’s attention that, after these cider-making sessions, Charlie was not in a very fit state to walk far. In any event, she agreed that Charlie could spend his nights in the back of Helen Foley’s car, which was kept at the end of the barn where Arthur Ulric had kept his. The rest of that barn had been converted into stables for two horses, as Anne Foley was keen on riding. Stephanie is also remembered by Jill Evans as the person most troubled by The Vine’s ghost (we apologise to the reader for keeping him/her waiting so long for that most essential element in the history of any old house!). Stephanie used quite often to call Jill over at night time to tell her that she had been disturbed by “strange” music (remember, these were in the days before Tarrington Brass!) footsteps and moving curtains, when the rest of the house was in bed. Jill herself heard this music (and describes it as very unreal) – and certainly does not dismiss the idea of a ghost. She believes that one of the subsequent owners of the house actually had a service of exorcism performed – with, it seems, satisfactory results. Certainly the present occupiers have not been troubled with disturbances from any supernatural source. An interesting aerial photograph (Plate 18) of the house, gardens and surrounding buildings dates from the time of Helen Foley’s occupancy (we guess the 1960s or the 70s). It is instructive to compare both what has remained the same and also what has changed since the date of the photo. Of the latter, there is the cultivation of the field behind the house, now a paddock. By the mid 1980s Helen Foley was approaching her 80s and finding coping in the house difficult. She had a hip-replacement and a minor stroke. Eventually she fell and broke her leg quite badly and, around 1985, it was decided that it would be best for her to move to a nursing home. There she celebrated her 80th birthday but sadly died a few days later. In 1986, a little while after Helen Foley had left the house, the decision was made by the Foley Estate to sell The Vine – to Robert and Rosemary Gordon-Blacker. Thus the house passed out of Foley ownership after 285 years. Under the Gordon-Blackers, livestock made a late, and brief, return to The Vine as cows were kept in the cow-shed (now the Granny-annex). Rosemary Gordon-Blacker also bred red-setters which she showed at Crufts. From 1988 to 1990 the house was owned by Mr J.L.Skinner who sold it in March 1990 to David and Bridget Lowther. In 1998 the house was sold to Richard and Jos Price, who, after extensive repairs and renovations to the house, moved in on their return from the Middle East in July 1999. Thus opened a new episode in an old story…..